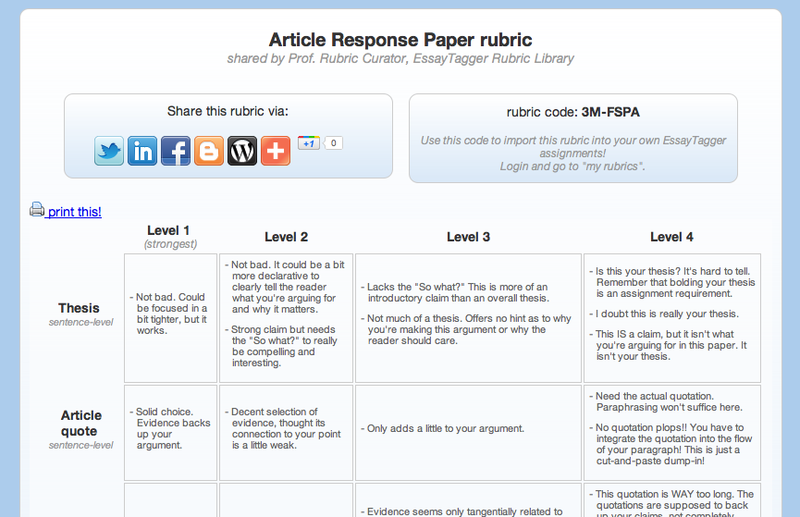 : Latest Update: Rubric sharing and rubric import! 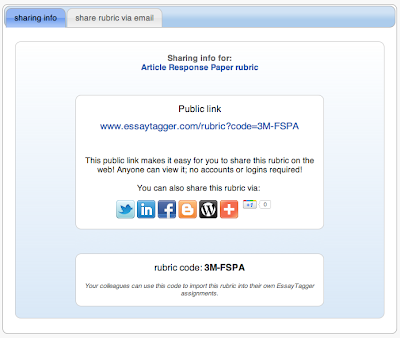 Instructions for using our new rubric sharing and rubric import features! 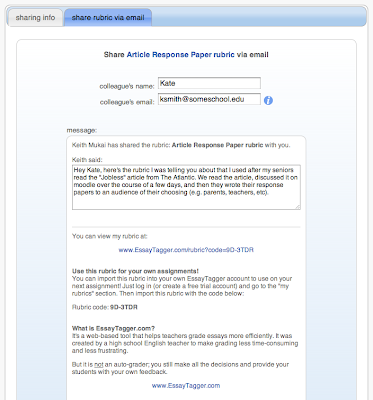 You can -- and should -- share your EssayTagger rubrics with your colleagues and/or the whole world wide web! The first thing to notice here is the public link. Anyone who has this link will be able to view your rubric. They do not need an EssayTagger account. Just click and view! So you can just copy-and-paste that link into an email, post it to your blog, tweet it, etc. You can explore this rubric at your leisure. But what I'd like to point out is the social media sharing buttons. You can post to a link to this rubric to Twitter, Linked In, Facebook, Blogger, WordPress, Google+, and more (the white plus icon opens up to an insane list of sites). There's also the "print this!" button I mentioned earlier. Click it and it'll reformat the rubric into a printer-friendly version and open up the print dialog. Macs make it easy to "Print to PDF" from the print dialog. You can use "Print to PDF" to save the rubric as a PDF file on your computer. Anyone can view your shared rubric, but only if they have the link. Each link has its own "code" parameter that is sufficiently complex to make it highly unlikely that someone could simply type in random characters and discover your rubric. This is similar to how YouTube protects "unlisted" videos. Enter your colleague's contact info and add a personal message in the space provided. Scroll down and hit "Submit" and we'll send the message out for you (note: we won't save your colleague's email address; we're not using this to build a spam list). The second half of the equation is to leverage other users' efforts and import one of their shared rubric into your EssayTagger account. You can then customize it and use it in your own assignments. It's super-easy. 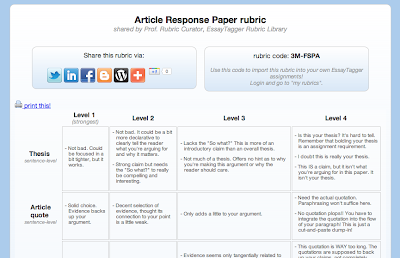 The code is clearly displayed at the top right when viewing the rubric via its public link. The code is also integrated into the public link itself. Find the code of the shared rubric you'd like to import into your account. Go ahead and try it with my rubric here for starters. 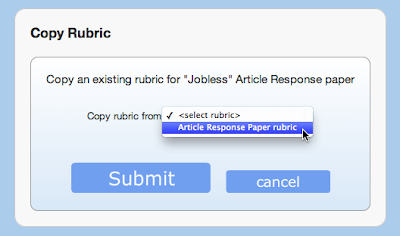 Go to the "My Rubrics" page by clicking on the link in the new top nav menu bar. And then you're good to go! Follow the steps above to associate the rubric with a new assignment. 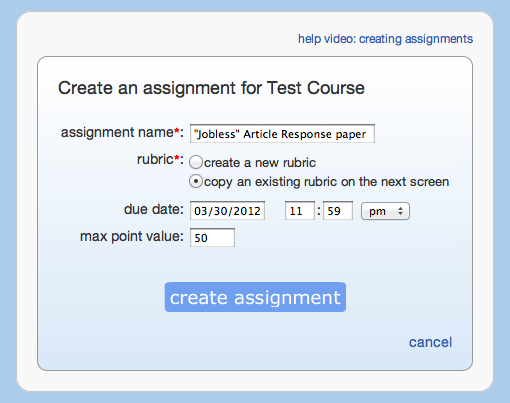 Then go to the Detailed Assignment View page (go to Instructor Home then click on the assignment name). Click on the rubric name listed under the assignment name. That'll take you to the View Rubric page where you can then click "edit" to make your changes to the structure of the rubric. Note: You can't add or edit comments on the Edit Rubric screen; adding, editing, or deleting comments all happens within the grading app (see the Quick Tips bar on the far right of the grading app if you need help).